Inflow results were analysed by the teams. However, some modelling teams fitted the inflow into the injection system whereas some other teams calibrated their strategies by means of the inflow into the sample. Thus, the analysis of the inflow modelling results does not provide meaningful information and therefore has not been included in this report. Figure 9 shows the outflow results, see Table 7 for a summary. Model BGR/UFZ is not able to correctly capture the shape of the post-breakthrough curve (there is some delay with respect to the observed data) but similar peak values are obtained. Similar comments apply to LBNL-C and LBNL-D models; although the peak outflow value is reasonably well captured, the overall shape of the modelled outflow curve is not well described. The two models proposed by CNSC (both CNSC-E and CNSC-D) fail in describing the outflow data and the results are four orders of magnitude smaller than the experimentally observed; whereas the damaged-based KAERI model reasonably describes the shape of the experimentally-observed outflow. The three approaches presented by UPC/Andra fail in fitting this curve. Indeed, although the calculated outflow is slightly better fitted by the hydraulic model (UPC/Andra-H) than by the hydro-mechanical models, the peak value in this case is only about 40% of the observed values. On the contrary, model Quintessa/RWM leads to a good representation of the value at the breakthrough. However, the shape of the simulated curve is not properly captured. Table 7 Capabilities of the proposed models regarding flow. Figure 9 Comparison of modelled versus observed outflow results. Stress results are shown in Figure 10. As seen, evolution of stress at five different locations has been studied (at the injection load cell, at the backpressure load cell and at three different radial load cells). Although the description of the stress response during the hydration phase (from 0 to 39 days) is a key aspect, little effort was spent by the teams fitting this first stage. As observed, the models Quintessa/RWM and LBNL-C are the only models that properly capture the peak stress value at all the monitored sensors. Model BGR/UFZ is able to correctly capture this value along radial load sensors 1, 2 and 3. However, its prediction of the peak stress value at the backpressure load cell slightly underpredicts the measured value (it should be noted that BGR/UFZ did not postprocess the stress at the injection load cell and thus, BGR/UFZ model cannot be assessed in this point). At the radial load cells 1, 2 and 3, the peak stress value obtained by the rest of the modelling participants either underpredicts the physically-observed quantity (see CNSC-E) or overpredicts it (see damaged-based KAERI model, the hydro-mechanical models by UPC/Andra and the discrete model LBNL-D). CNSC-D is able to capture the peak value at load cell 1 but underpredicted values are obtained at load cells 2 and 3. 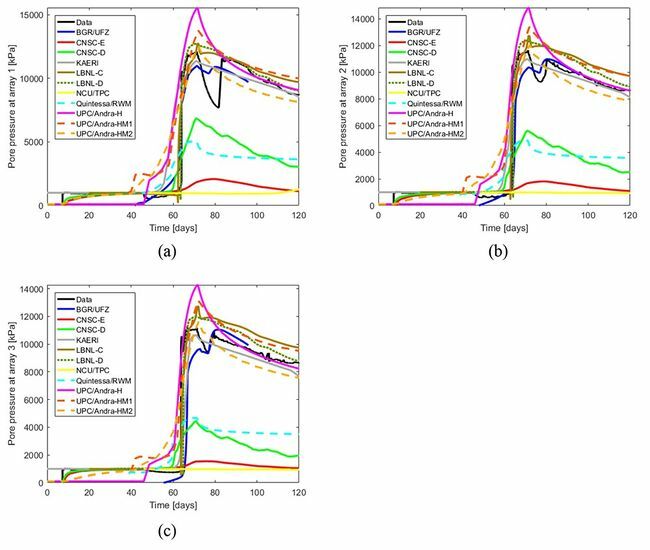 The predicted value at the injection load cell obtained by UPC/Andra, KAERI and LBNL-D is well defined whereas at the backpressure load cell is underpredicted (UPC/Andra, KAERI) or overpredicted (LBNL-D). 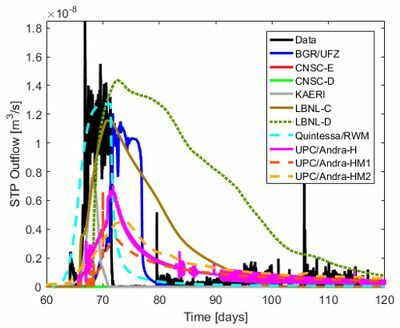 The post-peak shape trend is well defined by almost all models and only Quintessa/RWM, CNSC-E and LBNL- C fail in describing the post-peak curve. A visual inspection of the data indicates that many of the teams are able to capture the rapid increase in stress at similar times to the experimentally observed ones. However, simulated curves show precursor events which are not reflected in the data. Models proposed by CNSC and LBNL are the only approaches capable of reasonably capturing the exact timing when breakthrough occurs, see Table 8. (√: good, ~: fair; blank: poor; -: results not provided or not applicable). Figure 10 Comparison of modelled versus observed stress evolution at (a) radial load cell 1, (b) radial load cell 2, (c) radial load cell 3, (d) injection load cell and (e) backpressure load cell. Pore pressure evolutions at three different locations (arrays 1, 2 and 3) are shown in Figure 11. It is important to note that before gas breakthrough, pore pressure equals porewater pressure. However, once gas enters the filter, this is actually measuring local gas pressure. As seen, models KAERI, LBNL-D and UPC/Andra-HM2 are able to properly capture the peak value at all the arrays. The continuous model proposed by LBNL provides good predicted peak values in sensors 1 and 2 but the breakthrough pore pressure at sensor 3 is slightly overpredicted. Reasonably good peak values are also obtained with BGR/UFZ and UPC/Andra-HM1 models. However, at these arrays, highly overpredicted (with model UPC/Andra-H) and underpredicted (CNSC-E, CNSC-D, Quintessa/RWM) values are also obtained. 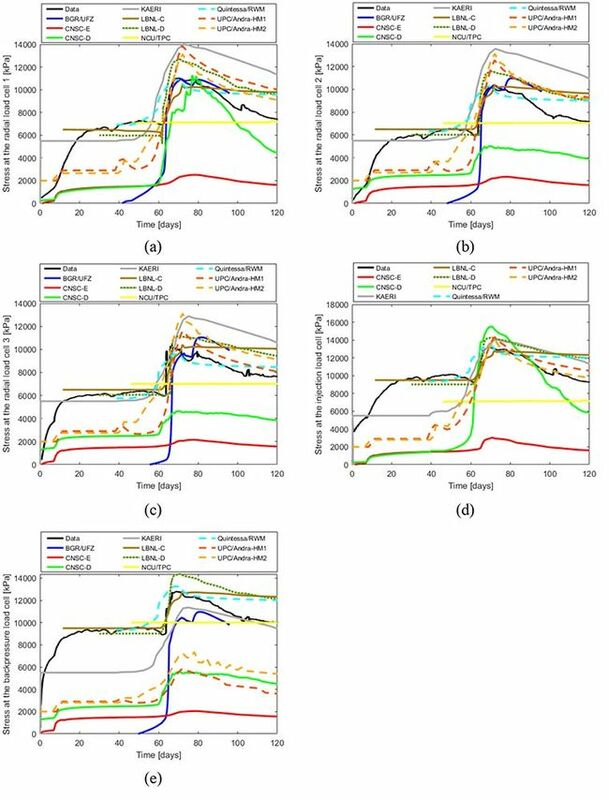 As happened with the stress response, (i) the post-peak shape trend is well defined by almost all models and only Quintessa/RWM and CNSC-E fail in describing the post-peak curve (now model LBNL-C provides good post-peak shape fitting) and (ii) the two models proposed by CNSC and LBNL are the only approaches capable of properly capturing the timing when breakthrough occurs, see Table 9. As happened also with the stress response, the rapid increase in pore pressure is modelled by many of the teams. However, this is obtained at early times by some of them. Table 9 Capabilities of the proposed models regarding pore pressure evolution (√: good, ~: fair; blank: poor). Figure 11 Comparison of modelled versus observed pore pressures at array (a) 1, (b) 2 and (c) 3.